"If it looks good, EAT IT!" See something you like, but a bit unsure how it should be eaten? Here you will find suggestions for how Southeast Asians may traditionally prepare and eat our products. However, cooking is an adventure so we encourage you to explore! ﻿Nam﻿ is a fermented pork sausage, as well as the namesake of our company. Despite the recommendations on the label, the truth is many Southeast Asians throw caution to the wind and eat it as is. If you're feeling less adventurous, you can enjoy nam sliced and pan fried. Pork nam is a key ingredient of Nam Khao, a beloved Lao dish featuring deep fried rice balls that are then crumbled and tossed with finely diced nam, grated coconut, herbs, limes and more. Grab some lettuce and enjoy your nam khao lettuce wraps! Fried Beef Paradise (Seen Savanh) - Literally translated as "heavenly beef", this is by far our most popular product. Our sweet and savory beef jerky easily wins over newcomers to Southeast Asian snacks, yet is a favorite among seasoned palates. Crack open a crisp lager and enjoy this heavenly snack straight up, or with a side of sticky rice! Lao Style, Thai Isan Style, Sweet Chinese Style, Sausage with Glass Noodles, or Dill Style Sausage - No matter which one you choose, these sausages are your greatest weapon at your next family cookout. There is nothing more delicious than the simple, smoky goodness of sausage just off the grill. 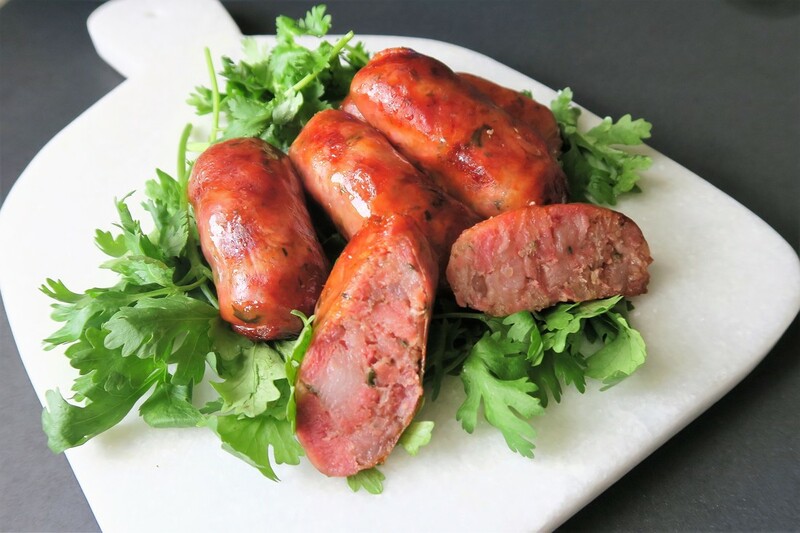 Oriental Brand Cured Sausage, more commonly known as Twako, is a hearty beef sausage common to Cambodian cuisine. Twako is best simply prepared by baking or grilling. Enjoy with a side of steamed jasmine or brown rice. Cha Lua is a pork ham commonly found in Vietnam. It can be enjoyed alone as a snack, or as an accompaniement to Banh Cuon, a wrap made of rice batter stuffed with minced pork, wood ear mushrooms, garnished with fried shallots, and drizzled with nuoc mam sauce. It is also used in Banh Mi sandwiches: baguettes spread with pate and stuffed with cha lua, head cheese, cucumber, carrots, shredded daikon, cilantro, and sometimes chili or jalapeno peppers. Beef, Pork, and Beef with Tendon Meatballs. Let's face it. Pho is not pho without meatballs. 'Nuff said. Looking for a delicious snack? Toss your meatballs in the deep fryer and glaze with sweet chili sauce. Fried Sliced Pork Skins, Fried Pork Rinds, Fried Pork Ears are found across many food cultures. Some people call them cracklings, some call them chicharrones. For Southeast Asians, they are most often eaten as a crunchy contrast to papaya salad, a burn-your-face-off-spicy salad of shredded young papaya tossed in a dressing of fish sauce, chili peppers, lime, garlic, and sugar. Break off bits of the pork skin and use it to scoop out each torturous bite! * For those in the Providence area, you can find many of the dishes mentioned at Lao Lanexang Market. Visit them at 373 Smith Street in Providence, RI. 401-272-2678. Support independent businesses!